Ages: 7 and up. 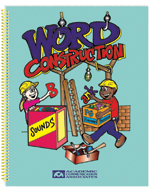 The activities in this book build phonological awareness, word awareness, and increase students' knowledge of the structural components of words. As children participate in the activities, they learn to manipulate sounds within words and to construct words by using common phonograms (e.g., -at as in bat, cat, and hat. In addition to the activities, the book includes lists of phonograms, phonetically spelled words, pictures of rhyming words, and other materials that will help you develop individualized programs of instruction. Reproducible pictures and worksheets are included. Listening for Sounds within Words. Students are asked to manipulate the sounds within words by eliminating specific sounds or modifying them. New words are "constructed" by making these modifications. Using Phonograms to Construct Words. Each lesson focuses on a specific phonogram. Students are asked to construct words that contain the phonogram, to finish incomplete sentences using words with the target phonogram, to use clues to identify words containing the phonogram, etc. Using Compound Words. Students are asked to create compound words by combining words. Words are presented in isolation and in sentence contexts. Constructing Words with Prefixes and Suffixes. Students are asked to define commonly used prefixes, to expand words by adding prefixes and suffixes, and to break words into parts by identifying prefixes and suffixes. The activities focus on phonemic and word awareness competencies that are critical for success in literacy instruction. The activities are especially valuable for students with speech and language disorders and students who are struggling to acquire basic literacy skills in the classroom.